Looking for VTMR Modding Tutorials? Check out the Modding Tutorials section of e-mods.net. Here is a list of File Types used by the Redemption. This is in hopes of removing confusion about the differences of similar file extension names. Description: Are actually zip files that are uncompressed, containing additional files inside. Location: Main Vampire - Redemption folder. Description: Are files that contain template data (props, npcs, players, ect ect). Description: Are models that contain mesh, bone, and material information about an object. Description: Are animation files for models - these are assigned in an NMS file. Description: Are motion definition files that tell a model what animation file to use for what event. Description: Contains a list of discipline effects. Description: Contains a list of disciplines and their assigned groups. Used in conjuction with game.ndg. Description: Contains a list of discipline groups and their exp costs. Descriptiong: Used by player types like Christof for starting stats, items, and disciplines. Description: This file contains the information on clans and controls the clan list in multiplayer. Description: Is the file that contains data on particles in Redemption - like fire and steam. Description: A treasure class file containing treasure class values using random treasures for chests and shops. Description: These are tag files that contain conversation scripts (controls timers and multichoice options). Description: These files contain basic command flags for AI (enemies) and starting disciplines for enemies. Description: Contains timer scripts for explosions (damage, damage radius, effects) all in milisecs. Description: Tells what wav (audio file) to use for what event (sound to use when feeding, walking, ect). Descriptiong: Custom created camera paths and angles for use with cutscenes. Open With: Viewed\created in the Redemption game using -devmode in your game's shortcut - otherwise ran in scripts. Description: These files contain a list of items available in a shop (store). Here is a graphical representation of VTM - Redemption's folder structure showing what files go where. 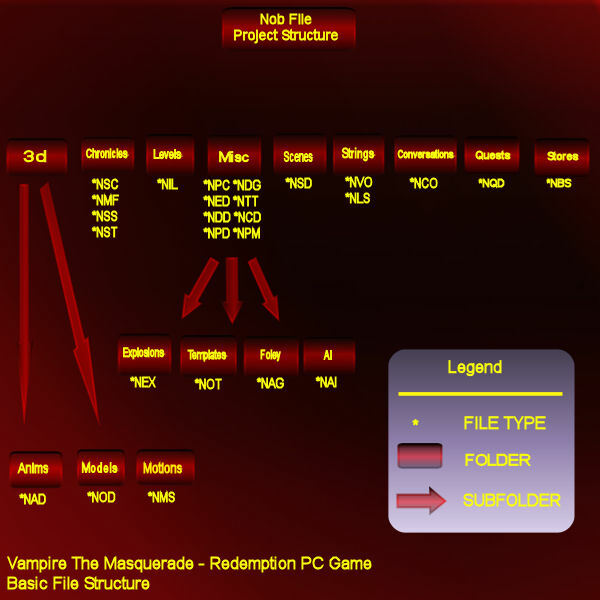 This image shows the various folders used by the Redemption game engine along with what files are usually contained within them. The arrows are pointed to additional subfolders beneath the folder in question. The image displays that within the 3d folder are three other folders of Anims, Models, and Motions. Within the Misc folder there are several subfolders with designated files. An example: The .NOT file types are located within Misc/Templates folder. The .NPC files are located in just the Misc folder. I hope this sheds light on a few things. I checked not long ago, and more recent versions of Maya will open the game's 3D files. I guess that's because every new version of Maya builds on top of the older one rather than starting from scratch. Kind of like with 3DS Max. Come see the World of Darkness unfold. Sorry, PLE version 7 was able to use the files, but version 8 isn't. If I still have it, I could probably swing it your way. I'm still waiting for Freyja to have a .nad exporter. Rainmoon picture isnt complete, i wrote description of missing folders(after all *.nob extraction- dont worry game runs good). Text behind / ignore its same info in czech from my mod both language documetation. Codex - *.class,javac.exe, javadoc.exe, javai.dll and batch files to creation javadoc documentation, Codex.dsp is project for Microsoft Developer - Studio 5, i thin only another way of complation, than by commnad line, last is mssccprj.scc, i think next compilation file from MSDS5 / *.class a javac.exe, javadoc.exe, javai.dll a d?vkou soubory na vytvořen? javadoc dokumentace a Codex.dsp jako project do Microsoft Developer - Studio 5, jde podle m?ho o jin? druh kompilace, ne? přes př?kazovou ř?dku a pak je?tě mssccprj.scc, soubory kter? m? asi tak? co dočiněn? s kompilac? -environment - *.wav sound of environment /*.wav zvuky prostřed? -StereoAmbient - sound on background of locations / zvuky na pozad? lokac? Brujah antitribu from pagan europian blackearth(now in Prag), but with roots in Scandinavia. Iv recently got introduced to MEL (it has syntax that is strikingly similar to C or Pascal) and im thinking about the idea of writing a new NAD exporter for Maya 2008, and I wonder if its possiable.. So to get a better prespective of this project it would help if you could tell me what are the main difficultys in writing a new NAD exporter? Also what exactly are the smoothing curves mentioned in the NAD file structure specifications cause that is the only part im not sure I understood. Hmm I pretty much figured what the Curve fitting factors are, calculating them is something different but Ill try writing a basic MEL algorithem soon. At least Maya has all of the tools to build that exporter. Looks like the guy working on Freyja have little intention of continuing the NAD exporter he started so I wont wait on that. That would be news worthy of the front page when you pull it off. I have developed a mild phobia of C++ these days. Javo Iv asked a friend who is a programmer and he says C# eliminates the dangerous things in C++ (pointers) so you might want to check it out and maybe use it instead of C++. Since I should be able to write the same in Maya's Python API I think I wont have to deal with pointers. What do ya know. C# is the last class I'll be taking before I graduate college. I dont think Freyja Nad plug in will ever be developed... but new Nad file animations will give a little breath to this old game, hopefully someone will EVER develop one for one of the main 3d Apps in the future... or not. Note the .nob files. People have often been confused as to the difference between mods and the vanilla files. This image should give an idea on what the original game nob files are. Page created in 0.069 seconds with 24 queries.